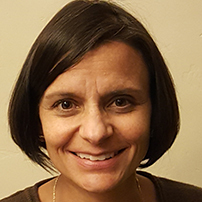 Claudia Trueblood is the Operations Officer of the College of Agricultural, Consumer and Environmental Sciences at New Mexico State University (NMSU) where she works on a variety of projects including strategic planning and international connections. Prior to that, she served the College as Director of the New Mexico Agricultural Leadership program for professionals working in the food, agriculture and natural resources sectors. Before joining NMSU, Claudia worked with a local Diocese for twelve years ending with a two year term as Executive Director of Catholic Charities. Claudia’s educational background reflects her interest in multidisciplinarity. She holds a Bachelor of Arts in Economics, a M.A. in Communication Studies, and a M.S. in Water Science and Management. In addition, Claudia has an Academic Graduate Certificate in Pastoral Studies from Loyola University and has participated in various leadership seminars and trainings including a Catholic Leadership Development Program through the University of Notre Dame.